2Department of Botany and Biotechnology, Govt. Arts College, Thiruvananthapuram, Kerala, INDIA. Introduction: Thuidium tamariscellum is a small creeping epiphytic moss growing on trunks and branches of trees as well as on moist shady rocky surface at high altitudes areas. Methods: The present study was undertaken to analyze the phytochemicals in the species and its antioxidant potentialities interms of DPPH, ABTS, H2O2, FRAP and metal chelating ability. Results: Total terpenoids level was remarkable. Interestingly, a concentration dependent free radical scavenging potential was noticed and was comparable with the synthetic antioxidant ascorbate. Further, the FTIR analysis of petroleum ether, chloroform, ethyl acetate, and methanol extract confirmed the presence of alcohols/phenols, primary, secondary amines, amides, alkanes, aldehydes, saturated aliphatic alkenes aromatics and aromatic amines, nitro compounds, carboxylic acids, esters, ethers, aliphatic amines, alkyl halides and carbonyls in the moss indicating the presence of medicinally important compounds like flavonoids, terpenoids and alkaloids in the various solvent extracts of the moss. Conclusion: The overall result of the present study showed that the moss is rich in important pharmaceutical compounds and was reflected as its antioxidant potential. Further studies are warranted to isolate, identify and purify the lead terpenoid present in the moss. 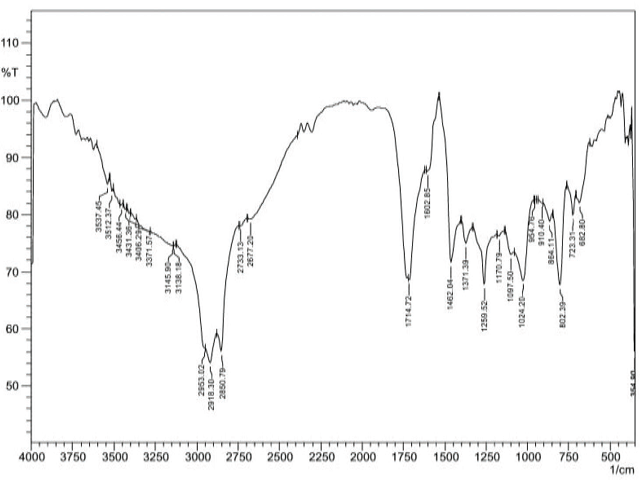 FT-IR profile of functional groups (cm-1) in Thuidium tamariscellum in petroleum ether extract. Mohandas GG, Kumaraswamy M. Antioxidant Activities of Terpenoids from Thuidium tamariscellum (C. Muell.) Bosch. and Sande-Lac. a Moss. Pharmacognosy Journal. 2018;10(4):645-649.